Of endless aeons, the primordial depths of space resonate. Thanks for all feedback in advance. 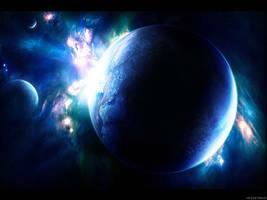 I just love how you find a way to make some of the greatest events in the cosmos look so wonderful threw digital art. This is incredible! I love the colors, the rainbow ring, the inky blotches look like black feathers to me. I like you take on nebulas. A bit different than the typical cloud style. They look like trees, at least the pines of one. Just a little remark : I think it would have been better without the central flare halo . Well, I do have a higher resolution version (full size is really 3000x4500), however I decided to only show the piece at this size.. Looks like I ended up 'torturing' some people for a larger resolution. Btw I should say im very glad to see you still putting work out. You were one of my favorite artists from long long ago when I was actually active here. I enjoy coming back from time to time to see you still producing top notch work man. Cheers. though I would like to see it a little bit bigger.. but no matter..
very nice composition. i like the textures and the flare man. you've got some awesome details in this piece. maybe a bit flat in sometimes..
very beautiful to see I loved it.. one of your bests in my opinion! I'd love to see it bigger! Sweet - flare, composition, contrast, texture, patterning, lighting, colours, stars, & depth. Image size a tad small, no? Aside from that, and the fact that the texture of the nebulae - especially the darker ones - seems a little thick in places, which detracts from the form, it's a stunning little piece. I actually like the 'bitesize' feel to it, though you could stretch that just a little. I'm not talking widescreen wallpaper size, but at least a K px wide. I see you returned with a visions of The Heavens gathered for the eyes of the onlookers..
cool job on it ^_^. I think it's a pretty ok piece, you have done better and will in further on. We can't always be on top, it's good to see you try something different . you are on the right track again somehow it feels a little flat though. Nice detail btw!! Great. and wacth. I'm hoping i can learn somthing from you. Well it looks ok bro, but not your best for sure. It's good to see you trying something new with this style though. that file is too small... to see all those stunning details.